Valencia CF had a busy summer trimming down the squad from the dead wood, while getting young but fragile wood that it can bury and grow. 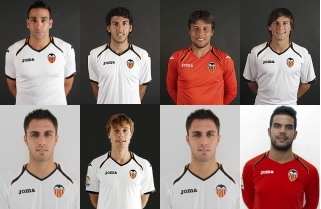 Overall Valencia released 15 players, some were sold and others had their contracts rescinded, but ultimatelly the wage bill was reduced dramatically, especially by releasing some of the biggest earners like Vicente and Del Horno, while Albelda stayed but for a lot less salary. Valencia CF reinforced the squad with 7 players this summer or 6 players technically since Adil Rami was purchased in the winter transfer window, although he only joined this summer. Cristiano Pereira was also signed, though he will be playing most of the time with Mestalla probably. Transfers in: Diego Alves(3m), Cristiano Pereira, Antonio Barragan(1.8m), Adil Rami, Victor Ruiz(8m), Daniel Parejo(6m), Pablo Piatti(7.5m) and Sergio Canales(2m). Transfers out: Vicente Rodriguez, David Navarro, Manuel Fernandes(2m), Juan Mata(30m), Miguel Angel Moya(loan), Miguel Angel Michel(loan), Renan Brito, Joaquin Sanchez(4m), Roman Alarcon Isco(6m), Del Horno, Sunny, Chori Dominguez(loan), Nacho Gonzales, Marius Stankevicious(loan end), Aaron Niguez, Cezar Sanchez. Valencia CF transfer dealings have put it with 13.7 million euros of profit, with the large majority coming of course from the sale of Juan Mata to Chelsea FC.